The 1500 game size of 40k doesn't get a lot of attention. 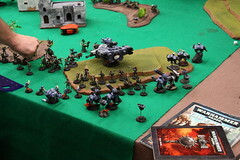 It is the first functional game size, and was cited as being the size of game that the in-house playtesters use at GW. It is occasionally used in tournaments in Europe, but American tournaments seem to play almost exclusively at 2000. The Sprue Posse Open single day tournaments use the 1500 size. The tournament uses a swiss system with 12 player slots, and therefore needs to get 4 games in to have a more healthy data set for its tiebreaker. In order to get 4 games in, 105 minute rounds are used. Too short for a 2000 point game. The size of the game has a direct effect on unit strengths, and overarching army construction. I'm going to talk about army construction mostly, and then follow it up with a regular series of what I feel the strongest lists are from each of the 16 codices at the 1500 level. The Sprue Posse Open uses the book standard missions, so those will be the guidelines. I heartily recommend designing a tournament list only after the missions have been made available, if the tournament you are planning to attend will be designing their own missions. The first thing to address is that the range of game sizes that are played on a 4' x 6' playing surface are 1500-2500. This means that in a 1500 point game, you are playing at the absolute minimum army size to playing surface ratio. This means lots of open space. Open space has significant relevance when planning to use units with deep strike capabilities, and also when planning to use weapons that have a scatter dice mechanic. Secondly, the number of objectives is not lowered for this smaller size, so during objective based missions the ratio between game size and number of objectives is at its smallest. After processing this information, we can conclude that successful 1500 armies will have a larger percentage of total points spent on troops. We can also conclude that deep striking will be more safe, and that armies will have more room to mitigate damage from scattering weapons by spreading out. I'm going to jump from those basic concepts right into some much more complicated stuff. I'll assume that you as the reader are well aware of the power and popularity of transport vehicles and are well versed in contesting objectives with tank shock moves. Transports are cheap and troops work very well with said transports. They gain assault protection, a tank shock move to contest objectives and extra speed for the large board and numerous objectives. They are more powerful and more prevalent in the 1500 format. At 1500 points, if a unit does not have the ability to be ballooned to 20+ models, coupled with morale manipulating special rules, then it will be transport mounted, or it will be simply considered a throwaway unit. The good news is that every army has access to efficient light vehicle kill. Transports are good for all the reasons listed, but none are particularly difficult to destroy. The closer to the action they get, the easier they get to destroy as they expose side armor and enter the range of special weapons. Weapons that kill transports efficiently are as valuable to players as the transports themselves. At this point the 1500 point list deviates pretty heavily from 2000. To prepare for a 5 objective seize ground on a 4' x 6' table, every army has a particular number of troops choices it needs. To defend against tank shock based objective contesting, a certain amount of anti-vehicle fire support needs to be bought. The number of troops units and the number of fire support units has negligible fluctuation as the game gets larger. Ultimately, the 1500 army has very little room for what I'll call table area influencers. Heavy anti-infantry firepower and devastating close combat units would both fall into this category. They are not purpose built to open transports, nor do they score, but armies rely on them to win games. When a transport dies, the unit inside still needs to die, it is still contesting or scoring its objective. Thanks to the 'go to ground' rule, moderate firepower will not dislodge them. Heavy, purpose-built, anti-infantry shooting and close combat units are perfect for that duty. They control and influence a section of the table, without scoring it. These units are also vitally important to counteract large model count units that aren't in transports. Anti-vehicle and small arms fire can not significantly weaken a 20+ model unit with special morale rules in cover. These area influencers don't function against transports, they need anti-vehicle fire support to work, and they generally don't score so they can't be taken as a replacement to troops. Even the close combat units that can be taken as troops can't often be counted on to accomplish both jobs. Troops get anchored to the objective once they reach that point. Close combat units need to have the freedom to pursue evading or 'back line' fire support units. So we've established that successful 1500 lists have less close combat and less anti-infantry firepower in their composition. You can't cheat this. If you put the cart before the horse and neglect anti-transport, you will be at a significant disadvantage against a mechanized army. And if you cheat on your concentration of troop units, or choose to field a dual purpose troop unit/elite close combat unit, then the large table and numerous objectives will spread you too thin. What is the 'right' number of troops? What is the 'right' amount of anti-transport? Well, its not that simple. Each army is different. Tougher troops allow you to run less of them. Faster troops might allow you to run less of them. Resilient and consistent anti-transport firepower will be able to stand on its own. Fragile, inconsistent anti-transport will need to be taken in multiples across multiple units. I'll discuss more army specifics as I get to each codex. Is 1500 a fun format? I think it is. There is a little less room for creativity in battle plan, but fortunately for most armies the 'right' number of troops and the 'right' number of anti-transport doesn't really go above 1,000-1,100. This gives you enough points for 2-3 units specializing in table area takeover. At 2000, more points can be spent here, and as there are more close combat units on both sides, the chance of a more dramatic close combat is higher in the 2000 point game. But as 1500 points allows the Sprue Posse Open time for 4 games. I will gladly trade a slightly more creative format for 33% more games against different opponents. 2 Response to "Playing: The 1500 point format"
Appreciate the insight into both your tournaments and the intricacies of 1500 points. I really need to get of my buff and come up and play in one of your tournaments, they look like a blast. Wow, what a find. I sure didn't know and/or had never thought of some of these things.